Welcome to Acquisition Games. 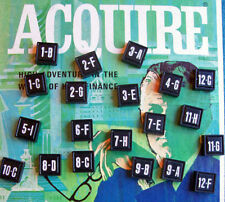 We specialize in the Sid Sackson creation of the game of ACQUIRE. We offer parts for the vintage games, variant kits,and vintage copies of the game. All of this led to the best variant of all, MEGAcquire. We appreciate your business and thank you for looking. (1) Individual Blank Plastic Tile(s) for 1962-76 ACQUIRE Game. Set of (3) Individual stock certificates for 1962-1963 ACQUIRE Game.